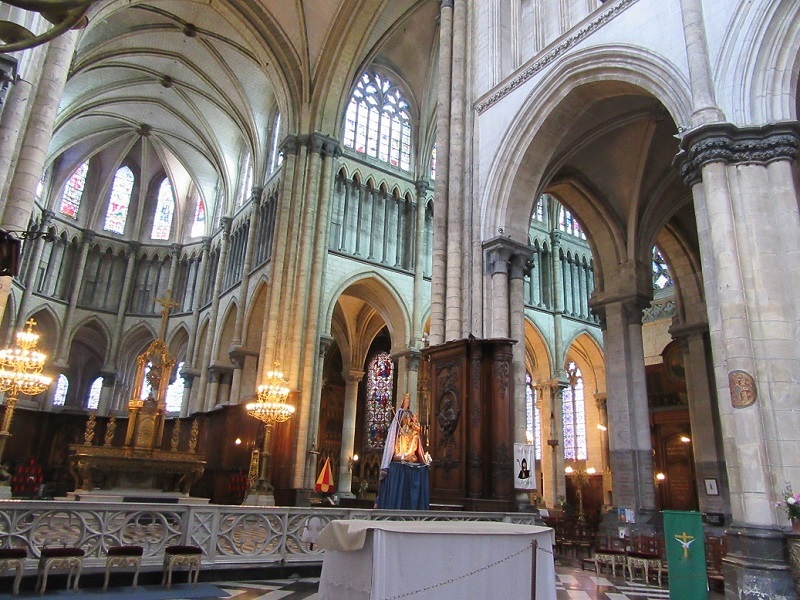 Saint Omer cathedral in northern France has grace and beauty. It doesn’t have the conventional architectural detail of sculpture encrusted entrance doors. But, it does contain priceless art works so typical of the great cathedrals of France. Here those artworks hang in dark, dusty corners without pomp and formality. Saint Omer cathedral has it’s own unique personality and remains the centrepiece of this imposing medieval City. Many centuries ago, the population of Saint Omer was roughly twice the size of what it is today. It was a medieval centre of great industrial, agricultural and civic importance, and is where Christianity was first brought to northern France by Saint Omer himself. The cathedral was founded in the 13th century and is an active place of worship to this day. The founding Bishop of the Saint Omer diocese introduced long pilgrimages and hiking expeditions to raise money to help support children with walking difficulties in the region. He was the ‘founding father’ of sponsored walks in a way and the cathedral is known as the shrine of shoes. It’s also home to a very imposing ecclesiastical organ, one of the most impressive in the world. Strangely it’s not particularly well known or visited – but surely it should be. Enter the cathedral and turn to face the western gallery and you’ll see the face of the wall is dominated by the massive organ. It seems to rule the form of the great church from its lofty position. 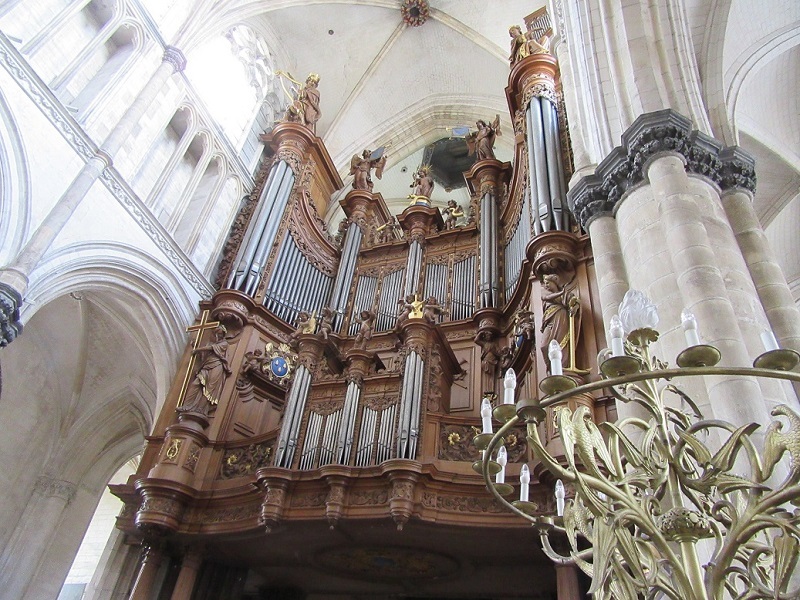 The organ was originally created by Thomas and Jean-Jacques Desfontaines in 1717. It is huge and consists of more than 115 pipes of various lengths. It originally included 45 playing stops. The wooden casework is an art form in its own right. The natural encasement is much admired by organ buffs from all around the world. It was known to be a very melodic instrument producing classically French tones. The stops and pedals were able to imitate flute and wind instruments of varying sounds. The volume was formidable and filled the cathedral with an empowering sound. The vast bellows were originally operated by at least one person to provide the enormous quantity of air needed to pressurise the pipes. Restoration work on the organ was carried out by Aristide Cavaille-Coll during 1853 and 1855. He added to or partially changed 30 of the stops. He also altered the overall tone of the instrument to suit the modern idiom, adjusting the tone upwards. Nowadays when the organ is played it requires a ‘crew’ of three people. The principal member plays the four keyboards. The one at the top has the higher keys and the bottom one, the lowest. The other two members operate the left and right stack of organ stops, assist with the array of foot pedals and turn the pages of the music as the sound progresses. Only nine local people are authorised to play the instrument keyboards, accompanied by their own assistants. And today, an electric pump is used to pressurise the bellows. The organ was classified as a Historical Monument in 1973. 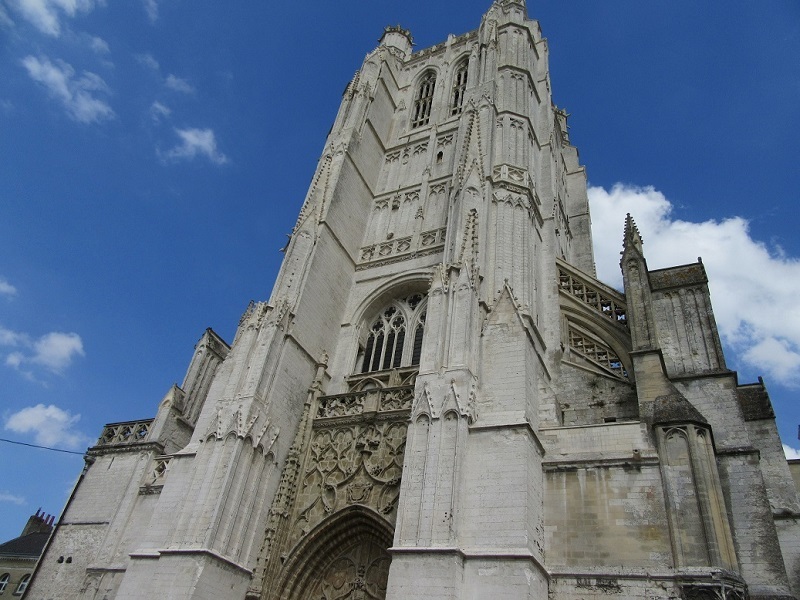 It’s well worth seeking out Saint Omer and the Cathedral to appreciate its history and majestic splendour. By Bob Lyons, pilot turned travel writer and a total Francophile.